Joel Sherman argues that the Yankees are tired of Joba Chamberlain’s “look at me” antics and are ready to let him go as a free agent. He won’t be a starter and he won’t be a closer, at least not with the Yankees, so the best thing is to let him walk and let him be someone else’s problem. He compares Joba to Nick Swisher (not the same thing) before him and David Wells before him, whether the comparisons are fair or not. NoMaas argues that the Yankees should use Ronnier Mustelier to replace the injured Curtis Granderson before they use Zoilo Almonte. Even though Mustelier is not really a prospect at 28, he’s the more consistent hitter right now. Almonte, having only just reached Double-A, is still a very impatient hitter and is still very raw, while Mustelier is much more refined. He’s the perfect asset for just such a situation. To determine how effective the Curtis Granderson-Brett Gardner swap would be, Fangraph’s Dave Cameron broke down the distribution of balls hit to the outfield and determined that center fielders see more balls in play. However, he also argues that the benefit of one man over another in center is small, since not many players will be in every game in every inning and not every ball is catchable, therefore the advantage of one player in a certain position is limited. Jeff Sullivan throws his hat in on the whole replacing Granderson story and believes that the Yankees can survive without him, since they also survived when Mark Teixeira was out and Mariano Rivera missed most of the season. He also believes that individual injuries don’t completely change a team’s makeup in baseball; the Yankees will still be good. The Yankees might miss out on about 1 Win Above Replacement due to the injury and can certainly make up for that in the short term, however, in a tight division, one win might be important. It’s About the Money has the highlights from Joe Girardi’s interview on the Mike Francesa Show. Of note, Girardi said the left field job includes about 5 or 6 candidates (Juan Rivera, Matt Diaz, Zoilo Almonte, Ronnier Mustelier, Melky Mesa, Adonis Garcia) and might even use a platoon if necessary. Eduardo Nunez will be at shortstop and DH, which kind of implies that he’s making the team. Sweeny Murti catches up with ex-Yankee prospect, Drew Henson, now the hitting coach for one of the organization’s two Gulf Coast League teams. He spoke about being a two sport athlete and the mental strain that came with feeling like he was always trying to play catch up. He struggled at putting his football career aside to pursue baseball full-time, but don’t worry, he still got a cool $17M from the Yankees before he decided to go back to football. 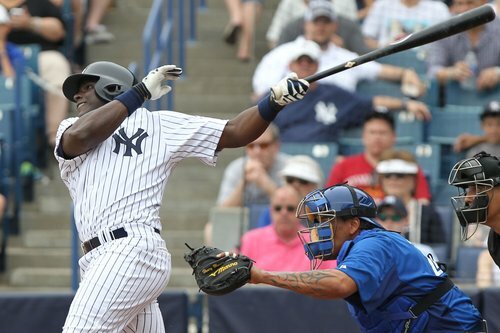 By selecting the worst offensive seasons by a Yankee at each positon, William, at The Captain’s Blog, was able to construct the ugliest lineup that ever existed. An overwhelming majority of these players came from the dead ball era and even included two Hall of Famers. Ty Hensley talks about growing up around the game of baseball and how he worked hard to emulate Roger Clemens and become a first round draft pick, a legacy he takes seriously. He also discusses how he uses his fastball and his relationship with his mentor, Luke Scott. Yankees – The Musical: Here is a bunch of stuff you need to know if you care about the musical talents of Dante Bichette Jr. and Mason Williams, together known as Navy58. In other musical baseball news, according to his twitter account, Kyle Higashioka plays guitar in a band. Mo is Back: Mariano Rivera pitched in a simulated inning, throwing 18 innings pitches, fielded a comebacker and a bunt, while also testing out his knee covering first base. He also broke a bat. In other news, the Earth orbits the Sun. The Yankee Pope: Cardinal Timothy Dolan, Archbishop of New York, not St. Louis, believes he has a better chance at replacing Alex Rodriguez on the Yankees than being the next Pope. This entry was posted in Yankees and tagged YANKEES STUFF 3/1/13 by edb23. Bookmark the permalink.